Hello! I’ve uploaded videos from No Doubt’s mini concert at Jimmy Kimmel live on January 8, 2013 to the downloads section. They are also uploading to my YouTube channel as I type this, and will appear there shortly. Thanks to “Hellrazor” for recording, and sharing! Also, Street Drum Corps recently uploaded a video to YouTube which includes Adrian! He’ll be a special guest performer during some of their upcoming shows at the Hard Rock Hotel in Vegas. “The No Doubt Family Is Growing! That’s so exciting there’s a new No Doubt baby coming! eek! Congratulations Tony, Erin, and your beautiful family! The documentary’s campaign on Kickstarter ends in three days, and still needs backers, so please go pledge! Hello! I’ve added some more videos, mostly thanks to my friend Pierre! Hello! Thanks to Pierre, I’ve added video of the 11/29/2002 Long Beach show to the downloads section! This was a little bit longer set than normal. Also, they played “Trapped In A Box”, and at the end Garbage and The Distillers came out on stage with them to play a cover of “Call Me”. @littlelamb05 Hi, after a breakneck spring, we’re recharging our batteries going into summer. It’s a good thing, actually. @JosehLorenz summer vacation, that’s all. Kids need parents to be around…not holed up in studio–most especially when school’s out. To celebrate the release of new pieces from the No Doubt & Fred Perry Collaboration, Adrian wants to give one lucky fan the shirt off his back… LITERALLY. Enter to win a No Doubt & Fred Perry Collaboration V neck sweater taken directly from the closet of Adrian Young. 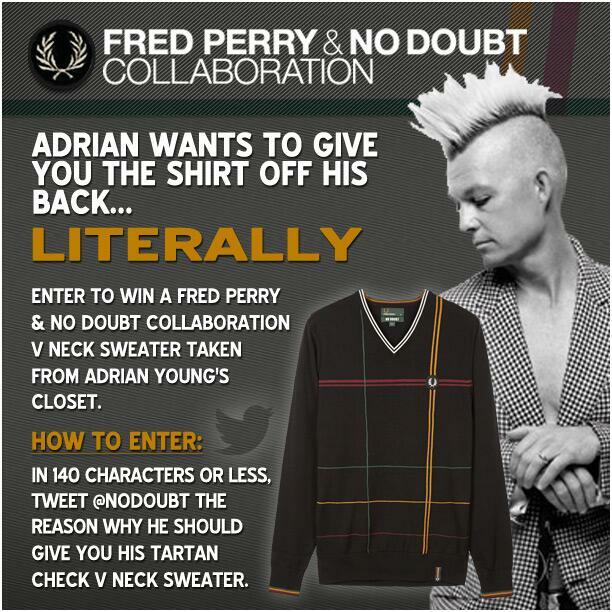 In 140 characters or less, tweet @NoDoubt with the reason why Adrian should give you his brand new sweater. The most creative entry will receive a tartan check V neck sweater from the band’s recent collaboration with UK clothing brand Fred Perry. Eric Keyes shared a couple screen captures with BSO of animations he did of Gwen and Tom in 1995. He worked on the Fox kids’ show called “The Klutter”, which was part of “Eek The Cat”, and he made a couple of the characters look like Gwen and Tom! Pretty cool! Check out the screen captures at BSO here. I’ve also added them to my YouTube channel. You are currently browsing the Greener Pastures – a No Doubt fan site archives for July, 2013.